Woodlands Elite Brings 39 Teams To Indy! Woodlands Elite Cheer Company is ready for a big weekend here in Indianapolis, Indiana! The Texas program started the weekend off strong by claiming back-to-back wins in the Small All Girl Level 5 Division at The MAJORS 2018. 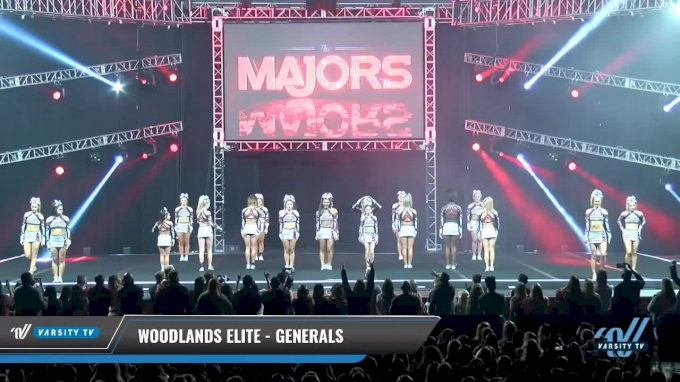 The Generals set the bar high last night with their five-star performance, but now it’s time for the rest of the Woodlands Elite teams to shine on stage at JAMfest Cheer Super Nationals. Woodlands Elite brought an all-star army to JAMfest this weekend as they have an incredible 39 times from across their four Texas locations. WE coach Matt Kelley said they're excited to put on a show this weekend in Indy. "Anytime our teams compete, they are ecstatic!" Kelley said. "But we are most excited to compete against teams up here that we normally don’t get to compete against." The program has put in the long hours at practice and now it's time to see if all their hard work will pay off. The coaches at Woodlands Elite hope all 39 teams put on strong performances in which they can walk off the mat and be proud. Kelley said they want their athletes to focus on their technique and deliver with strong execution. As a program, they hope their hard work pays off and they can walk away with a couple bids to The Summit & Cheerleading World Championship. Tune in to Varsity TV all weekend long to watch Woodlands Elite Cheer Company rock the mat at JAMfest Cheer Super Nationals.